In today's ever-changing and often-volatile business landscape, adaptability and creativity are more crucial than ever. It is no longer possible-or even desirable-to learn one set of job skills and work your way up the ladder. Rather, today's entrepreneurs and business leaders must anticipate change to create opportunities for professional success and personal satisfaction. 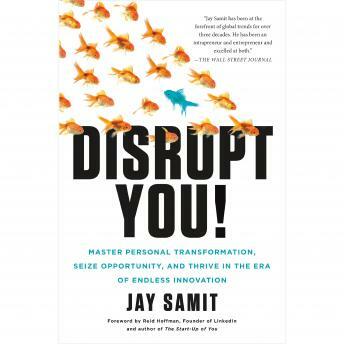 In Disrupt Yourself, Jay Samit-a digital media expert who has launched, grown, and sold startups and Fortune 500 companies alike-describes the unique method he has used to invent new products and grow established businesses throughout his career. Samit has been at the helm of businesses in the ecommerce, digital video, social media, mobile communications, and software industries, helping to navigate them through turbulent economic times and guide them through necessary transformation so that they stay ahead of the curve and profitable. In Disrupt Yourself, he reveals how specific strategies that help companies flourish can be applied at an individual level. By challenging assumptions, pinpointing one's unique value, and identifying weaknesses in the structure of current industries, anyone can achieve success and lasting prosperity. Incorporating stories from his own experience and anecdotes from other innovators and disruptive businesses-including Richard Branson, Steve Jobs, Elon Musk, YouTube, Circ du Soleil, Odor Eaters, Iams Dog Food, Silly Putty, and many more-Samit shows how personal transformation can reap entrepreneurial and professional rewards. Disrupt Yourself offers clear and empowering advice for anyone looking to break through; anyone with a big idea but no idea how to apply it; and for anyone worried about being made irrelevant in an era of technological transformation. This engaging, perspective-shifting book demystifies the mechanics of disruption for individuals and businesses alike.